Hot Water Pressure Washers . . .
GI Industries has a full line of hot water machines for every application. Our units have variable pressure controls, commercial rated pumps, industrial hosing, and durable frames. Call us for other models and applications. 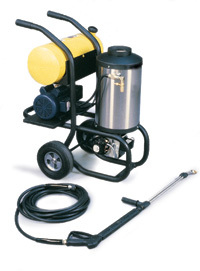 Chemical/soap injection after the pump, 20′ x 3/8″ high pressure hose with quick disconnect. 2 wands straight and right angled with multi-spray nozzle. Burner Diesel or Kerosene. Cart with 10″ pneumatic tires.